Restaurants have been adding interactive technology to their tables allowing users to view the menu and order on a tablet – there are even games for kids. Some of these tablets allows diners to pay without waiting for a check to be delivered. Pretty convenient, right? It gets better. 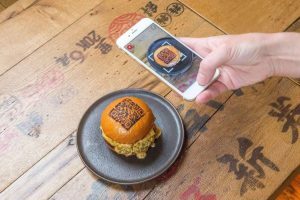 A Japanese restaurant in London has become one of the first in applying the QR code technology in the kitchen. ICHIBUNS has created the first burger bun branded QR code. The company has partnered with mobile-payment servicers, Zapper. The idea is supposed to allow customers to make easy, fast, and safe payments for the food by scanning the code on the bun with a smartphone. Diners can leave a tip and split the bill. Users need to download the app to pay which is made simple – all they need to do is scan the QR code on the bun. To incentivize users, ICHIBUNS is offering customers £7 off their first bill and other exclusive rewards. Benjamin Goldkorn, CEO of ICHIBUNS, said: “Our goal with ICHIBUNS was to be a restaurant experience like no other, and our partnership with Zapper is a great way to achieve this, allowing us to be at the forefront of hospitality innovation by offering much more than just a payment service. Combining it with our own app also allows us to give something back to our amazing, loyal customers, with discounts and prizes available to win.” We think it is safe to say this would be an experience like no other. Our question was what if you’re starving and quickly bite into that juicy wagyu beef burger only to realize that part of the QR code is now missing? Fear not. Your QR code is also printed on the menu. standard.co.uk/go/london/restaurants/you-can-pay-for-this-burger-with-the-qr-code-on-its-bun-a3927991.html (IMAGE CRED to this site).